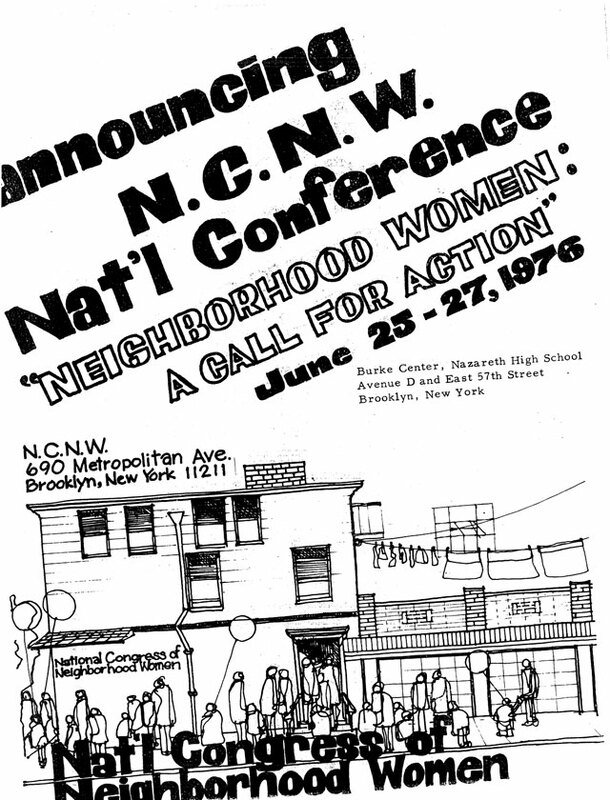 The First National Conference of the NCNW became a vital link for communication and support for working class and low income women who had been seeking a space where their interests, needs and concerns were truly addressed. Women from Appalachia, the barrios of California, Texas and New York, the neighborhoods of Boston, Pittsburgh and small rural towns, like Pritchard Alabama, all gathered with the aim to have a unified national voice. “Knowledge for Whom: Education as Culture Shock” was a New York City conference that brought together educators and community residents to share ideas and programs designed for community based college programs for neighborhood residents. The third national conference brought together over two hundred women from different cities in the United Sates. Workshops and panels dealt with issues of education, affirmative action programs for women, health services, employment, the media stereotyping of working class women, and women as community and political leaders. It also provided a forum for them to share their problems and successes as community leaders. The first Annual Alliance for Neighborhood Government was sponsored by NCNW and the Ethnic Neighborhood Action Center in Brooklyn. Conference participants developed strategies on housing, red-lining, neighborhood revitalization, shared community organizing and political outreach strategies. The fifth conference was co-sponsored by NCNW and the Ethnic Neighborhood Action Center. Its purpose was to increase citizen participation in all government programs and agencies, particularly regarding allocation of funds through community development grants and CETA Title VI, and to provide mechanism for citizens to voice their concerns about social service cutbacks in the areas of programs for older adults and children. Representatives from NCNW affiliates groups across the country met in Brooklyn to plan for a 1979-1980 national conference. Working sessions were also developed around the roles and responsibilities of affiliates and headquarters in a time of intense program development and expansion and the growing sophistication of affiliate groups. Technical assistance, direct services and regional outreach as means for strengthening the network of working class women were emphasized. Concept Outline for Stabilization and Expansion of the National Congress of Neighborhood Women, 1978, National Congress of Neighborhood Women Records, 1974-1999, Sophia Smith Collection, Smith College, Northampton, Massachusetts. 9 pp. Letter to Anchor Saving Bank, 1978, Box 112, National Congress of Neighborhood Women Records, 1974-1999, Sophia Smith Collection, Smith College, Northampton, Massachusetts. 1 pp. 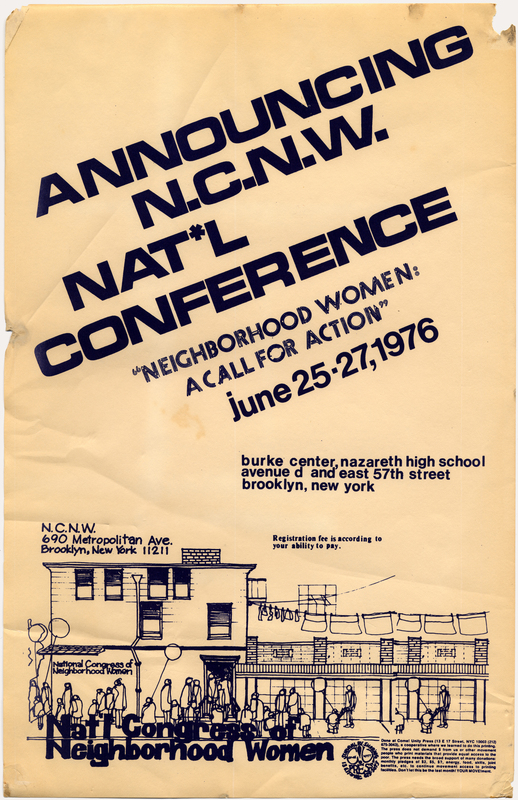 Document on Brooklyn Conference, 1978, Box 112, National Congress of Neighborhood Women Records, 1974-1999, Sophia Smith Collection, Smith College, Northampton, Massachusetts. 2 pp.